In the last two weeks I gave two presentations on scientific performance engineering, a theme that describes best what we do at my lab (SPCL) at ETH. 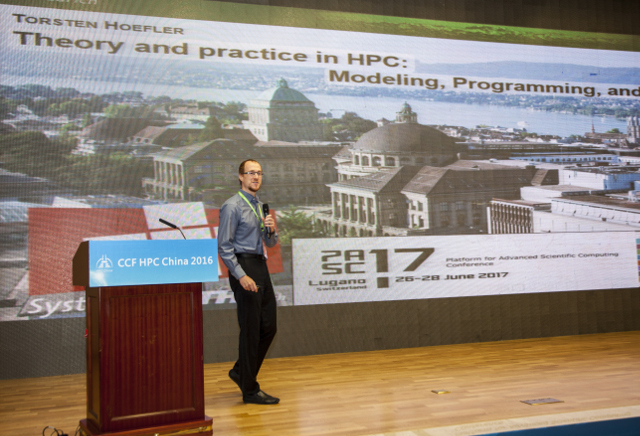 The first lecture was a keynote at HPC China, the largest conference on High-Performance Computing in Asia (and probably the second largest world-wide). I have to say that this was definitely the best conference that I attended this year due to several reasons . Here an impression from the impressive conference. Shortly after that, I presented a similar talk at my home university ETH Zurich as the last step in a long process . It was great as well — the room was packed (capacity ~250) and people who came late even complained that there were not enough seats — well, their fault, there were some in the front . Some were even paying attention! In case you missed it, I gave a longer version of the same talk at Cluster 2016 in Taipei (more content for free! ).